Cape Town surfer Dene Botha is at it again! The 28 year-old surf coach, commentator, actor and entrepreneur has been selected as one of 50 finalists in the 2010 Cleo Bachelor of the Year that will crown the country’s ‘most eligible bachelor’ in December. Having already been awarded the Axe Sweet Life ‘Most Irresistible Man’ and Mamba-online ‘Sexiest Man’ titles in 2009, as well as featuring as Mr March in Cosmo’s ‘12 Sexiest Men’ last year, your vote can help Dene clinch the 2010 Cleo award. Currently No. 4 in the rankings, he needs to make the top 15 to qualify for the glittering final awards function in Johannesburg on 4 December where a judging panel will decide the Cleo Bachelor of the Year. The winner takes home prizes totalling around R130 000 including a Suzuki Alto 1.0 GLS car, a Canon Digital PowerShot SX20 camera, an XBOX 360 gaming console and a Paco Rabanne Black XS hamper along with becoming a Brand Ambassador for The Cross Trainer group. As the judging panel will take the number of votes cast by the public into account when deciding the winner, you can assist by SMS’ing ‘DENE’ to 35915 before the 15 finalists are selected on 30 November. To make it worth your while, voting for Dene makes you eligible to win one of two great prizes – either a hamper of VonZipper eyewear and accessories or a two night stay for two at the upmarket Almasi guest house in Sea Point. To become a prize-winner just add Dene’s number – 082 687 8434 – to the SMS you send to 35915 when voting, or find ‘Dene Botha’ on Facebook and leave a message on his Wall notifying him that you have voted. Winners will be announced on Facebook and contacted personally. For further details see www.cleobachelor.co.za where you can also enter to win one of five hampers of Paco Rabanne his and hers fragrances. You can only vote once so to prove the adage that ‘Surfers Rule!’ send ‘DENE’ to 35915 and help to get him elected as the Cleo Bachelor of the Year! Be sure to join the Billabong Girls Get Out There Summer tour at one of their eight FREE beach day activations as they travel the country’s coastline from KZN right through the Garden Route and on to Cape Town. Each event promises a fun-filled day for the entire family, with a primary ploy to get girls onto the beaches and experience the healthy, energizing Billabong lifestyle. A free creative is also available throughout the day, where girls can express their creative side with paints on canvas, beading and sand art. As if that’s not enough, Sony, Von Zipper and Nixon will be giving away awesome prizes at each event so make sure you fill out as many entry forms as possible at the beach to stand the chance of winning. Starting at 10am and wrapping up at 3pm, join the Billabong Crew for plenty of free fun in sun with the Billabong Girls Get Out There Summer Tour 2010. Puerto Del Sol, Puerto Rico (Saturday 6 November 2010) – Kelly Slater (USA), 38, enhanced his reputation as the greatest surfer of all time when he clinched an historic 10th ASP World surfing title in Puerto Rico yesterday and then went on to win the Rip Curl Pro Search, his 45th career elite level event victory. Despite the emotional and dramatic celebrations after the momentous achievement, Slater regained his focus to overcome an inform Taj Burrow (AUS) in their semifinal encounter before posting another stellar performance against Bede Durbidge (AUS) in the final, posting a perfect 10 point ride that left his opponent in a combination situation and needing to improve on both his scores. Puerto Del Sol, Puerto Rico (Saturday 6 November 2010) – Kelly Slater (USA), 38, moved to within one heat win of an unprecedented 10th ASP World surfing title by advancing to the quarterfinals of the Rip Curl Pro Search in Puerto Rico yesterday. The former nine-time ASP World Champion and current World No. 1 is now guaranteed of a minimum 5th place finish in the event and only needs to advance to the semifinals and third place to clinch the title and a spot in the annals of global sporting history. Even if Slater loses in his next encounter, South Africa’s Jordy Smith (Durban), 22, the current World No. 2, will have to win the contest to extend the ASP World Title Race to the last event of the year in Hawaii next month. The Rip Curl Pro Search, Event No. 9 of 10 on the 2010 ASP World Tour, completed Rounds 3 and 4 yesterday following a two-day suspension of competition out of respect for former ASP World Champion Andy Irons (HAW), 32, who tragically passed away on Tuesday. Slater survived a hard-fought battle against local wildcard Dylan Graves (PRI), 24, in Round 3 and then defeated Adriano de Souza (BRA), 23, and Jeremy Flores (FRA), 22, in their non-elimination Round 4 clash to advance directly to the quarters. Smith halted any ASP World Title celebrations yesterday by blending impressive tube rides, massive rail turns and fin-free manoeuvres to dispatch Gabe Kling (USA), 30, in Round 3. Despite the monumental task ahead, Smith remains positive about his approach to the remainder of the event, citing his enjoyment for the sport as a major motivation in his continued performance. Smith then produced a sensational late charge in Round 5, sending Owen Wright (AUS), 20, and Chris Davidson (AUS), 34, to Round 5 while he advanced directly to the quarterfinals. When the contest resumes, Slater will be up against the winner of the Round 5 heat between good friend and ASP World Tour stalwart Taylor Knox (USA) and Brazilian rising star Adriano de Souza in his bid to wrap up what would be a momentous achievement. Event organizers will reconvene today at 7am (1pm in South Africa) to assess conditions for a possible 7:30am (1.30pm) start. When competition resumes, up first will be Taj Burrow (AUS), 32, up against Jeremy Flores (FRA) in the opening heat of Round 5. 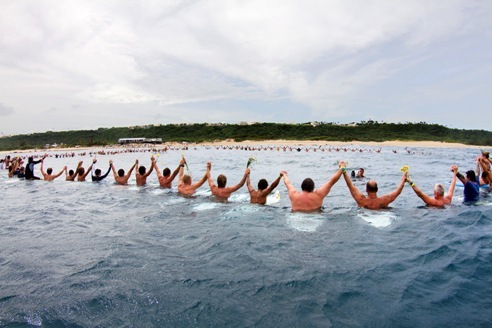 The Do Great Things Trust, an NPO founded by Cape Town based businessman, world renowned big-wave rider and Mavericks contest winner, Chris Bertish, has the philosophy that it is the little gestures in life that mean the most to people and every little gesture, every kind act, no matter how small, helps in making a positive difference to someone’s life. Bertish says it starts by just giving a little back to less fortunate people and supporting other charities like the Cancer Association, Reach for a Dream Foundation, Doctors without Borders and My Life Project. The first Fundraiser for the ‘Do Great Things Trust’ will be a party on Friday 26 November followed by Bertish’s CANSUP110 event on the Saturday and the Sunday, where he will be attempting to become the first person to paddle a Stand Up Paddleboard (SUP) from the V&A Waterfront in Cape Town along the coastline to Langebaan on the West Coast. This mammoth undertaking, covering a total of over 110km, will raise additional funds and generate awareness for the abovementioned charities. The Water Safety for the paddle expedition will be kindly handled by Marine Scene and supported by Texies Seafoods. 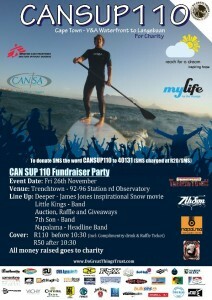 The exciting charity party on Friday 26 November will held at the legendary location of Trench Town in Observatory, Cape Town, featuring an inspirational snowboarding film, three top bands, a raffle and a charity auction with unique items up for grabs. Organised by The Do Great things Trust, in conjunction with CMB Agencies, and sponsored by Corona and Vitamin Water, the doors open at 6.00pm and R110 gets you in with a free complimentary drink and a raffle ticket for prizes sponsored by O’Neill, Fox, Ocean Minded, Hurricane, CMB Agencies and Naish. The event kicks off with the premiere of the long awaited and inspirational O’Neill / James Jones snowboard film, “Deeper”, at 6.30pm, followed by reggae rockers, The Little Kings. Surfer and comedian extraordinaire Mark Sampson will then MC the charity auction which includes one-of-a-kind memorabilia items autographed by Mavericks winner Chris Bertish, along with block-mounted posters signed by O’Neill sponsored South African Jordy Smith, the current World No. 2 ranked surfer. The winners of the awesome prizes in the raffle will be announced before Seventh Son and Brazilian drum & rockers Napalma take us on a journey of rock and jungle drumming for the rest of the evening with local DJ’s spinning us through until after 11pm. All proceeds generated on the evening will be presented to the Cancer Association, Reach for a Dream Foundation, Doctors without Borders and My Life Project after Seventh Son has rocked the crowd. For more information on the party and CANSUP110 please go to www.dogreatthingstrust.com/picsvideos. Donations can be made by SMS’ing ‘CANSUP110’ to 40131 (R20/per SMS) and you can also donate funds via EFT or PayPal. Visit www.dogreatthingstrust.com for details. So come and unite with us at Trench Town on the evening of Friday 26 November and thump the night away by doing one great thing and making a small difference in someone else’s life. And keep an eye on the media for Bertish’s latest exploits as he left on Sunday on a whirlwind journey to Oregon, on the West coast of the USA, to compete in the Nelscott Reef paddle-in big wave contest, an event where he finished third last year and became the first to ride the wave on a SUP. The sixth edition of the Nelscott Reef event has been given the green light to run on Tuesday 2 November in what are forecast to be the biggest waves in its history. See www.nelscottreef.com for more. After finishing 2009 ranked third in the inaugural Big Wave World Tour standings, Bertish is also honoured to have received his first invitation as an Alternate competitor in the Eddie Aikau in Hawaii. The world’s longest running big-wave event has a waiting period that runs from the beginning of December 2010 to the end of February 2011 and the contest is only held when Waimea Bay is over 20 foot. Porta Del Sol/Puerto Rico (Monday, November 1, 2010) – Stephanie Gilmore (AUS), 22, has claimed her fourth, consecutive ASP Women’s World Title, making history at the Rip Curl Women’s Pro Search Puerto Rico. With her Quarterfinal win over Melanie Bartels (HAW), 28, Gilmore amassed enough points to knock sole remaining contender, Sally Fitzgibbons (AUS), 19, out of the running for the 2010 ASP Women’s World Title Race. Today’s ASP Women’s World Title clinching is the latest in a long list of achievements for the young Australian, which include: ASP Women’s World Tour Rookie of the Year (2007), two-time Vans Triple Crown of Surfing Titles, 15 ASP Women’s World Tour event victories and four consecutive ASP Women’s World Titles.